Want to avoid distractions and be more productive? Here’s a simple yet effective way to stay focused and get more done each day. Recently voted as the most popular productivity hack, the Pomodoro Technique is a time management philosophy that helps people to maximize their productivity while avoiding burnout. It enables them to manage the inevitable distractions of the working day and focus on the task at hand. You use a count-down timer and assign 25 minutes to the completion of a certain task. That period of time is called a “Pomodoro” (named after the tomato-shaped timer that Cirillo used). You can use any timer you like, from a basic kitchen timer to an app on your mobile phone. Simply set the timer and get to work. 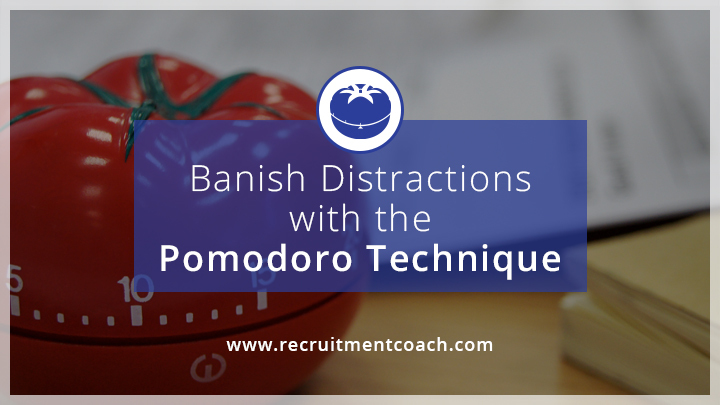 During your Pomodoro, you should not allow yourself to be distracted from your task. Once the 25 minutes is complete you make a note in order to track how many Pomodoros you have successfully completed. Then follows a compulsory five-minute break to refresh mind and body. If you happen to be distracted during a Pomodoro, then you don’t get to press “pause” — the Pomodoro ends there, and you have to start a new one later. This working in focused sprints may seem a little inflexible to some people, but if done properly, it empowers an individual to be in control of their day rather than their day being in control of them. Have you ever noticed that at the start of the working day, it seems that you have ample time to achieve all your objectives, but when it is time to go home you often wonder why you haven’t achieved more? The Pomodoro Technique is a great tool for becoming much more accountable as to how you’re using your time and what you’re actually achieving. I personally find that being aware of the timer ticking down really helps to focus the mind. The effect is quite remarkable in terms of increasing your concentration while not allowing yourself to get distracted. The subtle pressure of seeing the seconds disappear can often bring out the best in people. The other benefit of this technique is that it allows you to work with higher intensity while staying fresh throughout the day. The 5-minute breaks every 25 minutes allow you to relax, take a walk around the office, call a friend or watch a motivational or funny video on YouTube. Your mind switches off from work as you are giving it permission to do so. Every 4 Pomodoros it is suggested that you have a 20-minute break, just enough for a stroll outside or a bite to eat. You won’t always be able to complete a full Pomodoro. Some surprizes and genuinely urgent or business critical interruptions are unavoidable. However, the end goal is to complete as many Pomodoros as possible. You will be surprised at how many you can do if you are truly focused. You can even compete with your colleagues to see who can do the most in a day, and who has the highest average number of completed Pomodoros per day. Soon the office becomes a hive of productivity. For the recruiters who I train and coach, this increased awareness of, and accountability for, how they’re spending their time can pay big dividends. It helps them to focus more of their time on those activities that bring them closer to the next placement. For example, they can allocate blocks of time for contacting clients or candidates, and get far more calls done by using this technique. The Pomodoro Technique could be applied to social media, which can be a major source of distraction and drain on productivity if it’s not used efficiently. For me, the most important aspect in this is purely psychological. You set yourself a task every 25 minutes, and as long as it’s realistic, there is no reason why you shouldn’t accomplish it. That sense of achievement, every 25 minutes is addictive. Go ahead and try the Pomodoro Technique for yourself. You’ll be amazed how great you feel when you get your day (and your life) back under your control!